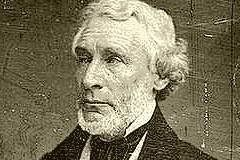 Born in Scotland, Bennett immigrated to American in 1819, taught school, then worked as a journalist. On May 6, 1835, he founded The New York Herald, printing it in a cellar. He was aggressive in gathering news, which ranged from the first Wall Street financial article ever printed (June 13, 1835) to sensational reports of fires, murders, and war. He developed many of the techniques of modern reporting, and he was the first newspaper publisher to make extensive use of the telegraph. He illustrated his paper extensively and even included a society page.